Celebrating Indie Publishing has a review from a much loved series, and as we’ve reached the third book of the series, I’m now eagerly searching online to see if there is a fourth book due! 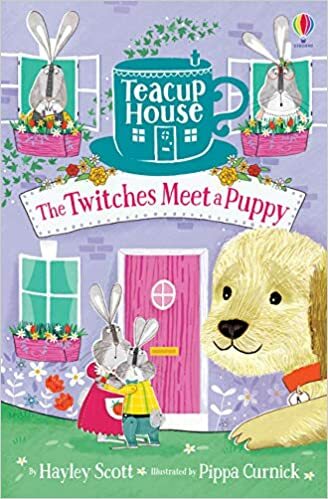 We originally reviewed the first book of the Teacup House series in July 2018, and book two in September 2018, so I am thrilled to share our thoughts on book three now! The Teacup House series is the work of the wonderful Hayley Scott and talented illustrator Pippa Curnick. All three books are available to purchase now from a variety of bookshops and online. Open up the Teacup House – and meet four little rabbit heroes with big ideas! Watch out, Twitches – Stevie’s got a furry visitor. The teacup house is turned upside down when a bouncy puppy comes to stay! Silver and Mama Bo hide in the garden, and meet a creature who needs their help. Before we’d finished reading book two of this series I had already ordered a copy of book three. The Twitches were fast becoming a firm favourite with my little bookworm, and she’s regularly asked for a few chapters of these books as a bedtime read, and often the go to books that have to be packed in her backpack when she visits grandparents in case they want to read a book … think it’s safe to say she loves these books! In this outing, we meet up with Stevie just after the events of the party in The Twitches Bake a Cake, she and new best friend happily playing with the bunny family and their lovely house in the garden, when as you can guess from the book title and cover … a puppy comes along to cause havoc! This caused no end of giggles and gasps of horror as the excitable young pup bounds about the garden, investigating new smells and sights before upturning the Teacup House and the contents. But in usual Twitch style, there is an adventure to be had, and this time it’s the turn of Mama Bo and young Silver. Although, I’m beginning to notice a trend here, Silver Twitch seems to be getting up to no end of mischief, if there’s an adventure to be on, you can guarantee she’s around or involved – my kind of heroine! Can the Twitches save the day? Will their beautiful home survive the puppy? And will Stevie finally learn that the toys aren’t what they seem? As always, the writing is just perfection. It’s exciting, descriptive and makes for an incredibly enjoyable read. The illustrations bring the story to life, they are crisp and vivid, and match the writing so wonderfully, there’s’ something so special about being able to see some of the events in the book as you read as well as being able to imagine them. We absoltely love this series and I cannot wait to see what Hayley writes next!